When it comes to running your commerce business, time is one of the most valuable resources you have. Systems and programs are constantly clawing for your attention, threatening to launch your business into inefficiency. In the realm of ecommerce success, automation is your greatest ally. This is never more true than during holiday shopping season. Having the right automation tools in place during BFCM can be the difference between a week (or month) of last second stress and late nights versus a sales weekend set up for automated holiday success! Shopify Plus users have access to two major automation tools that are helpful in enhancing your BFCM success: Launchpad, and Flow. Here is a quick and helpful overview of the Shopify Plus Black Friday automation handbook. Launchpad is the one stop shop where you can pre-plan, schedule and manage all of your BFCM sales campaigns. New themes, new products, new sales. All pre-programmed with Launchpad. Enjoy the ability to change your site theme on Friday morning, and have it switch back by the time Cyber Monday rolls around. Or, pre-plan multiple themes that will change throughout the entire holiday weekend. That special BFCM product you want to roll out specifically for new holiday customers? Setup a product unveil via Launchpad. Stop wasting time staying up late to launch new themes or campaigns when Launchpad can do it for you. Admit it, you are exhausted. Constantly keeping up with a million unseen operations is an essential yet draining process. 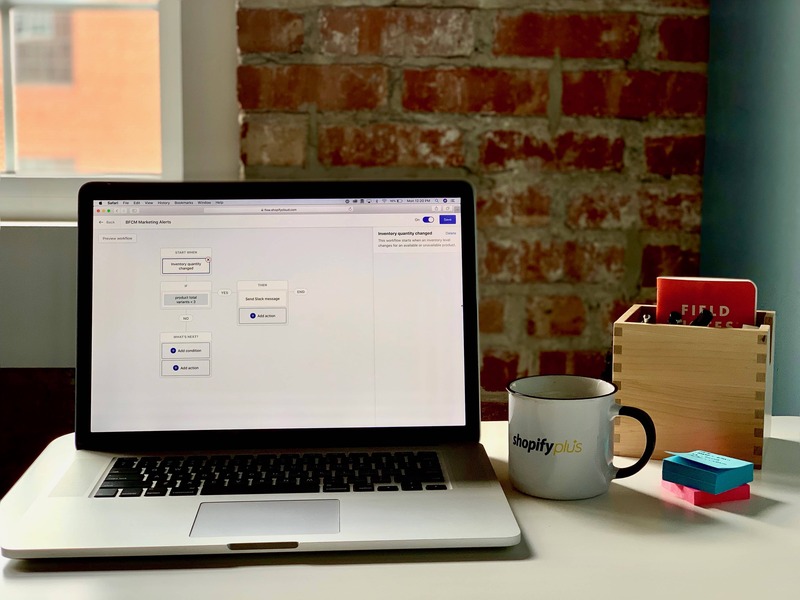 Shopify Flow is designed to help you automate some of those unending operations using simple “trigger, condition, action” formulas. And best of all, there’s no coding experience necessary! Need to know exactly when your inventory is getting low? Flow can track your inventory levels and immediately send a message to you when product is low. It also can make sure the product is hidden from your customers when it hits zero. It can be very frustrating when sales and marketing campaigns are still live even after your product has sold out. Flow can help by notifying your marketing team to turn those ads off once your inventory is gone. Using Flow, adding conditional customer tags has never been easier. You can track where customers came from via special campaign tags, and then determine how to target them based off of their purchase activity. This is immensely helpful when it comes to retaining and retargeting customers post-holiday sales season. Flow is a game-changer when it comes to keeping up with all of those miniscule tasks that spell out BFCM success. With Shopify Plus you can efficiently automate most of those major yet time-consuming operations and tasks to make your BFCM a massive success. And the beautiful part? With Shopify Plus, these automation tools are at your immediate disposal for free! Get started today utilizing these automation tools to set up your BFCM gameplan. Don’t hesitate to reach out to our team at Rehash if you have any questions or need help.